Why spend your precious time waiting in long shuttle or taxi lines. Avoid the language barrier and currency exchange. Travel in style from Madrid Airport MAD to your Hotel in Madrid City Center by private vehicle and reach your final destination relaxed and refreshed. 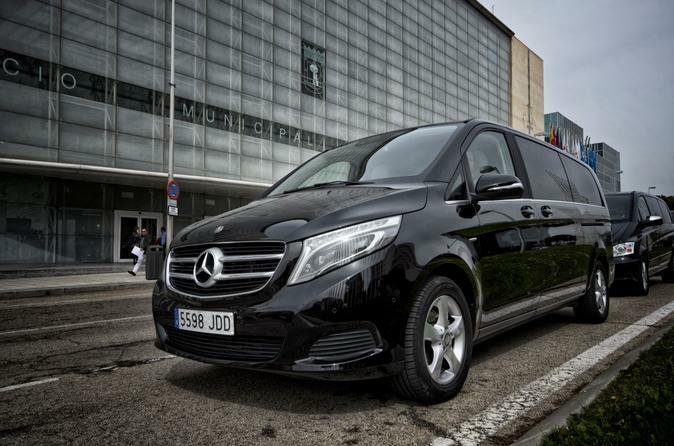 Enjoy a comfortable and a private transfer from or MAD Airport to Madrid City in an elegant and full equipped Mercedes Benz V Class or similar. Our Chauffeurs will be waiting at the arrival lounge just after you pick up your luggage and hold up a sign showing the name of the lead passenger. If there is a problem finding our Chauffeurs please contact the phone number shown on your voucher. All incoming flights are monitored, so you are safe in case your arrival is delayed. In case of a cancelled flight, your transfer will be automatically cancelled, free of charge. This service is available 24/7, year-round. Your private Chauffeur speaks English and will be happy to help you with any questions you may have about the city. can't see you at the meeting point. In the confirmation you will also receive our 24/7 emergency number, and in case of any query please do not hesitate to contact us.